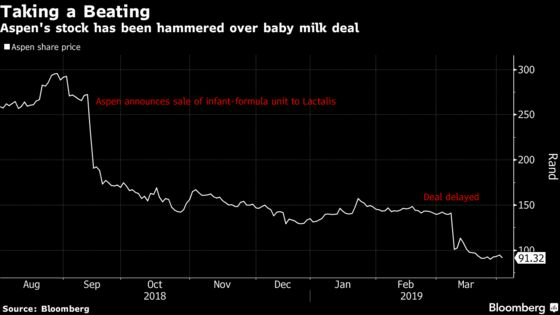 (Bloomberg) -- Aspen Pharmacare Holdings Ltd. is expected to receive final approvals to complete the sale of its milk-formula business within weeks, according to people familiar with the matter, after delays to the deal wiped out more than 30 percent of the South African drugmaker’s market value. New Zealand authorities have indicated that the disposal to French dairy company Lactalis International could be approved this month, said the people, who asked not to be identified because negotiations are private. As part of finalizing the deal, the division will then be restocked, the people said. The 740 million-euro ($830-million) transaction is central to helping Aspen slash a growing debt pile that’s been worrying investors. Africa’s largest drugmaker said last month that closure on the deal had been pushed out to the end of May from the end of December, triggering the stock’s biggest one-day slump in almost 21 years. The shares rose 5.4 percent to 97.60 rand as of 1:43 p.m. in Johannesburg, valuing Aspen at 44 billion rand ($3.1 billion). The stock is still down 31 percent since the most recent delay to the sale was announced March 8. Aspen’s borrowings include a 1 billion euro loan that matures in May 2020 and a 500 million euro facility due May 2022, according to data compiled by Bloomberg. The South African company has said it will look to exit some of its other non-core European businesses, to focus on selling hormones, anesthetics and anti-retrovirals in emerging economies. While the New Zealand regulator has received an application in relation to Lactalis’ acquisition of Aspen’s nutritional business, it’s unable to give a date for its decision, a spokeswoman said in an emailed response to questions. Aspen and Lactalis declined to comment.